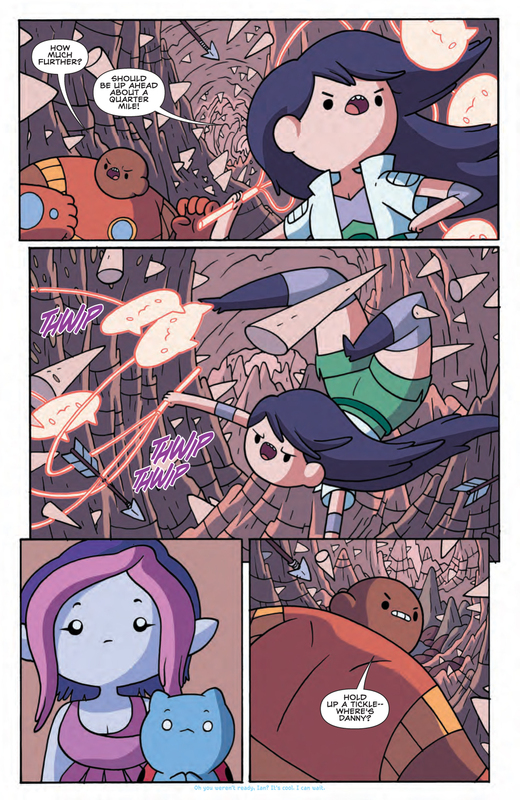 My word, people love Bravest Warriors. 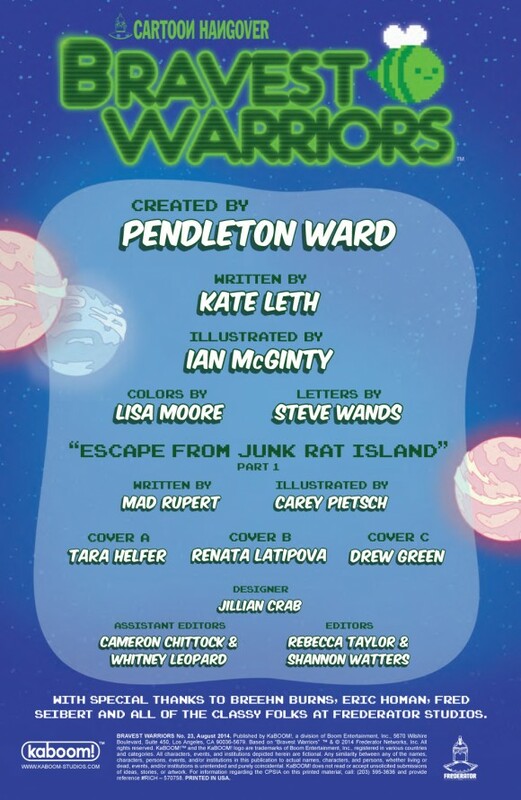 And we not only have the EXCLUSIVE preview of the next issue, we’ve got writer Kate Leth and artist Ian McGinty in the 13th Dimension! Bravest Warriors, for anyone not in the know, is an animated series from the same folks who brought you the wildly popular Adventure Time, led by Pen Ward. The same sensibilities apply, though they are definitely different. Anyway, Issue #23 of Boom! Studios’ comic-book version is out Wednesday 8/27, so check out the fancy covers and pages. But, hey look, Leth and McGinty are here for a MIGHTY Q&A about their book and the popularity of the Adventure Time ethos as a whole. Catbug must be so proud! Dan Greenfield: If I’ve never picked up Bravest Warriors until now, what do I need to know? Kate: Teens: IN SPACE! Beth, Danny, Wallow and Chris make up the core group of teen heroes fighting aliens and hormones on the outer reaches of the galaxy. They’re joined by half-mermaid Plum, a part-cat part-ladybug aptly named Catbug, a grouchy rainbow bear named Impossibear and an enormous wealth of bizarre and charming side-characters. Everyone has a crush on everyone. There are spaceships. 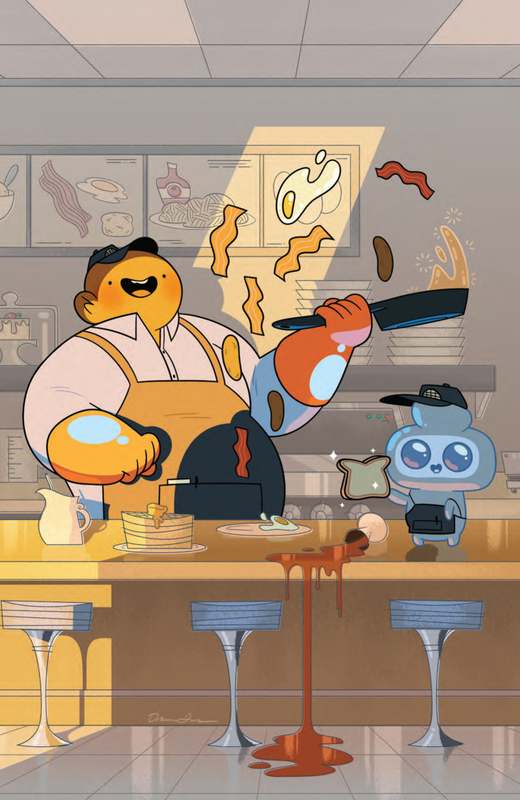 Ian: I’ve described it in the past as the Power Rangers Meets Space Balls, and really, even that doesn’t begin to describe just how crazy cool both the Cartoon Hangover animated series and the comics are. 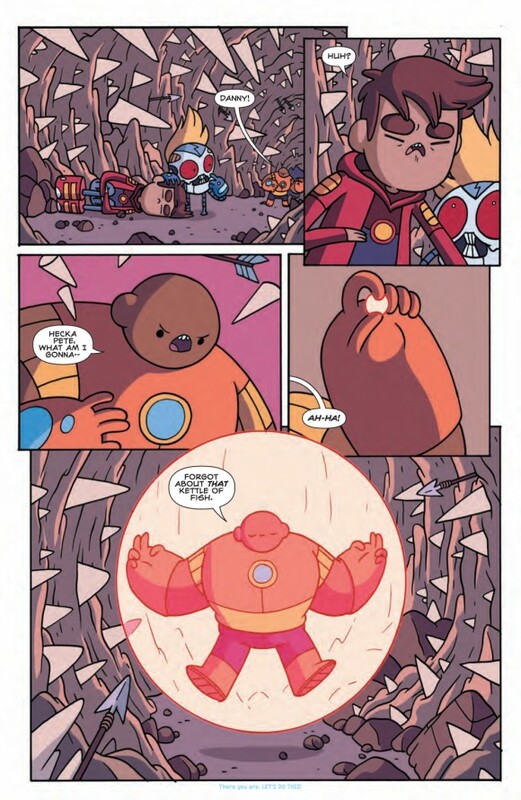 Essentially, the Bravest Warriors are a ragtag group of teenagers that live in space amongst other alien people and creatures. 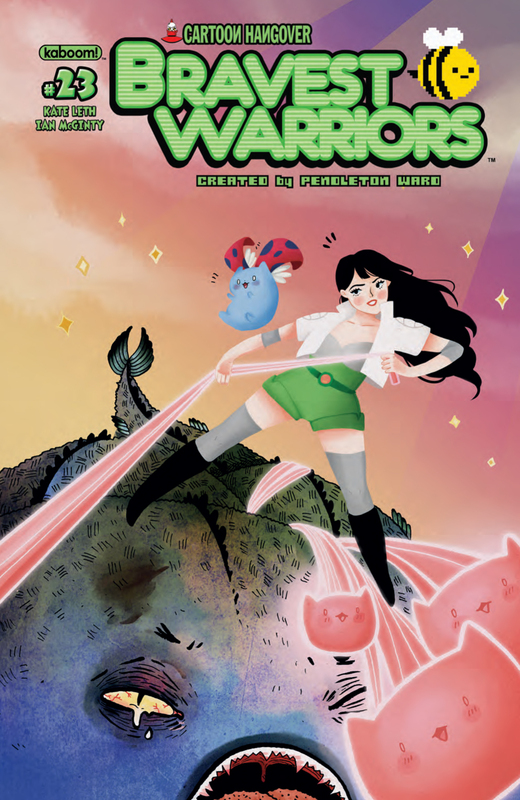 Since they’re warriors, they go off on planet-saving adventures but we also get to see a lot of them hanging out in their invisible base, eating space snacks and just talking about the same sort of junk you’d talk about with your best buds. And, of course, you’ve got Jellykid, Impossibear and Catbug, just about the coolest dudes ever. 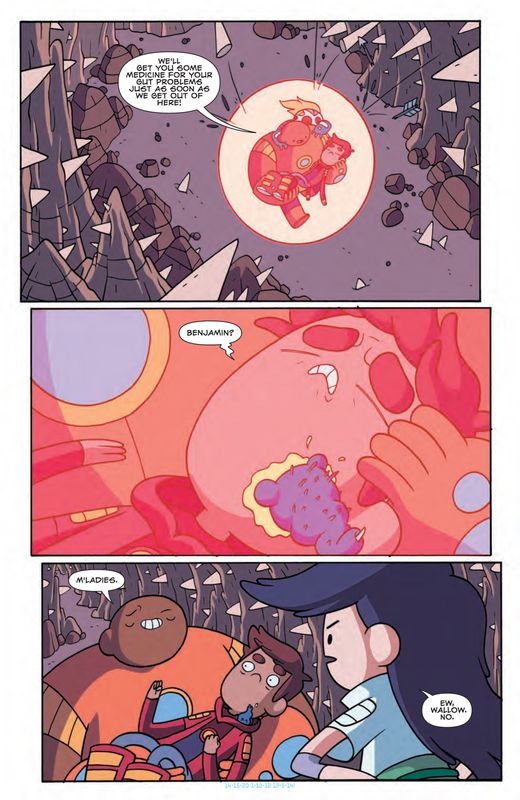 The whole Adventure Time universe has exploded among all age groups. Why has all this gotten into people’s heads? Kate: I always refer to the “elasticity” of the universes Pen Ward has created. You can invent anything — there are no limits to the reality, although there is a strange sense of logic to it all. Once you get a feel for the weirdness, you get what makes sense and what doesn’t. Then you push that a little and have a lot of fun. Want to invent a planet, a power, a device, an alien? You can. It feels a bit like being a kid with a fresh box of crayons and a whole box of printer paper. It’s great. 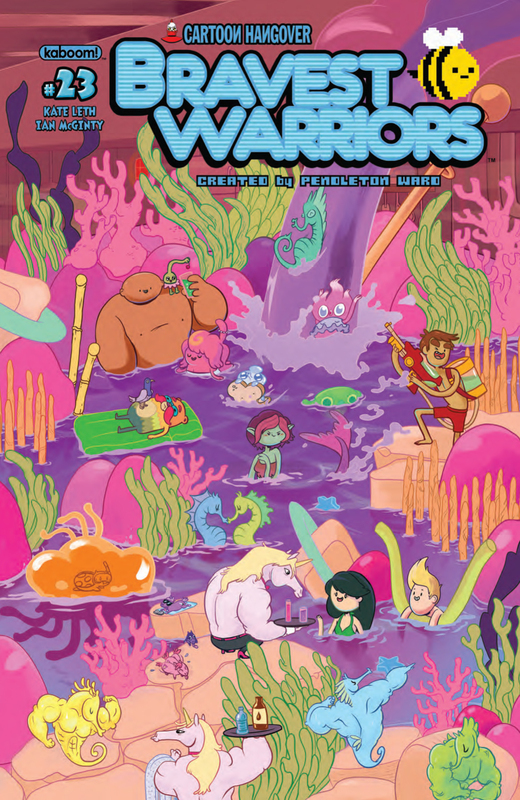 Ian: The appeal of the world of the Bravest Warriors, to me at least, is that it’s more frenetic and colorful (both figuratively and aesthetically), and yet it has a much more focused center. 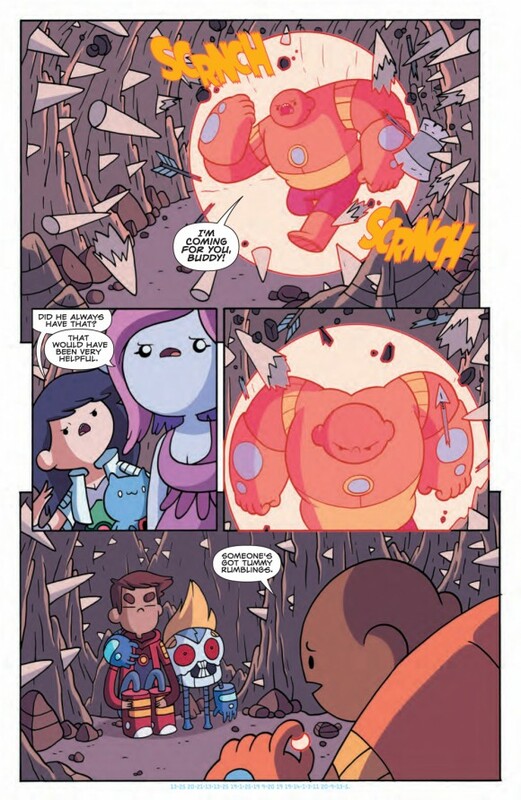 At heart, the Bravest Warriors is about your friends and all that good and bad drama stuff that goes with ’em. There are less characters, which allows us to bring their individual personalities to light more and explore what makes each one so special, as well as look at how their group dynamics affect relationships. I also think it’s a very, very unique comic (or show) when you can get your grab-bag of standard monster and alien fighting action in there as well as a romantic love story about a potato and a stick, and nothing seems out of place. Oh plus, you’ve got Jellykid, Impossibear and Catbug. How much freedom are you being given to tell your story? Kate: A lot. Ian and I came up with issue 25 on the walk back to the hotel from Calgary Expo. The idea of a “bizarro” Catbug just kept making us laugh, so we formed it into this really fun story. I’ve talked to people at Frederator a few times, who make the cartoon itself, and they’re been nothing but supportive. I keep warning them it’s going to get weirder and they seem pretty into it. Ian: Let me put it this way: As yet, I’ve had exactly ONE edit, which was because I forgot to draw on the bra part of Bravest Warrior Chris’ Slave Princess Leia outfit in Issue #24. So, yeah, Kate and I have a LOT of freedom to take this thing and run with it. What’s great is that we get to collaborate on story ideas together (instead of, say, someone just sending me scripts and giving me a deadline to produce art) and since we were fans of the series even before we got to work on it, it’s like a dream come true when we can add our own ideas and characters to the mythos. I mean, the comic series is just us, two people who are legit fans. That’s awesome. Which Bravest Warrior is your fave? Kate: Plum. No question. She isn’t even technically a Bravest Warrior, but she’s always been the most interesting to me. She’s flirtatious, her voice on the show is great, she’s a lot of fun to write. 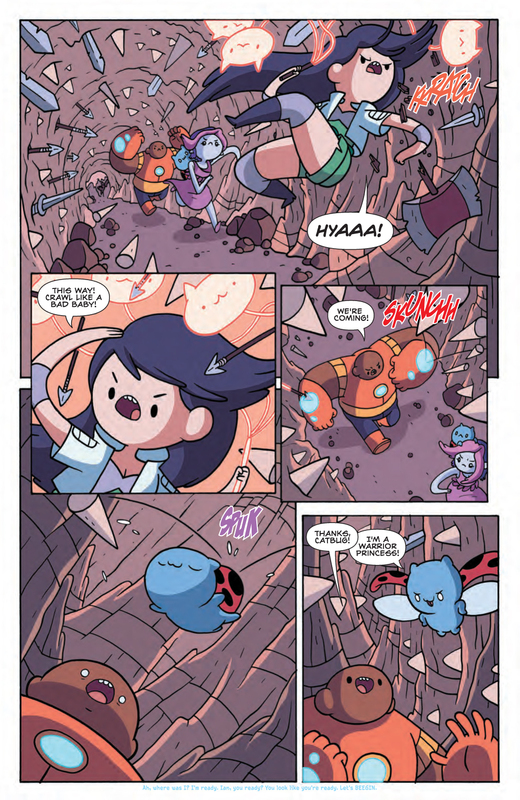 Her interactions with Catbug in the comic are the cutest parts, to me. Wallow is a pretty close second. Ian: Well, obviously Catbug but since he’s not technically a Bravest Warrior, I’d have to say Danny! He’s the character who we can REALLY mess around with, the Rocket Raccoon of the group, if you will. The George Costanza. The Chandler Bing. Other ’90s sitcom character references. But, yeah! I’m also a huge fan of Beth. She’s the sort of girl I was always trying to ask out in high school but just couldn’t get the gumption to do it. Smart. Cool. She’s got it all, plus I’ve got a deal with John Omohundro (who voices Danny on the show) that maybe someday we can get Danny and Beth together as a couple. Team DETH.